Come join the fun over on this challenge blog for a chance to win 5 QKR Stampede digital stamps of your choice! We hope you will join us as we support Penny's Paper- Crafty fun challenges and we look forward to seeing your creations. Ah, Valentines - the day we celebrate love. And who could me more in love than these two cuties? This is the QKR Stampede image Bear Hugs﻿ and the Sentiment is from the Best Wishes Werdz Set. What really sets this particular card apart is the Gold Foil detail, and you can order Gold Leaf in several colors. 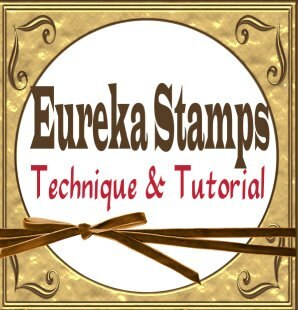 It's Technique and Tutorial Day for QKR and Eureka. Deb here to tell you about my experiment with Gold Leaf for this post. I've never bought Gold Leaf before because I've always heard it was really fussy and hard to work with. 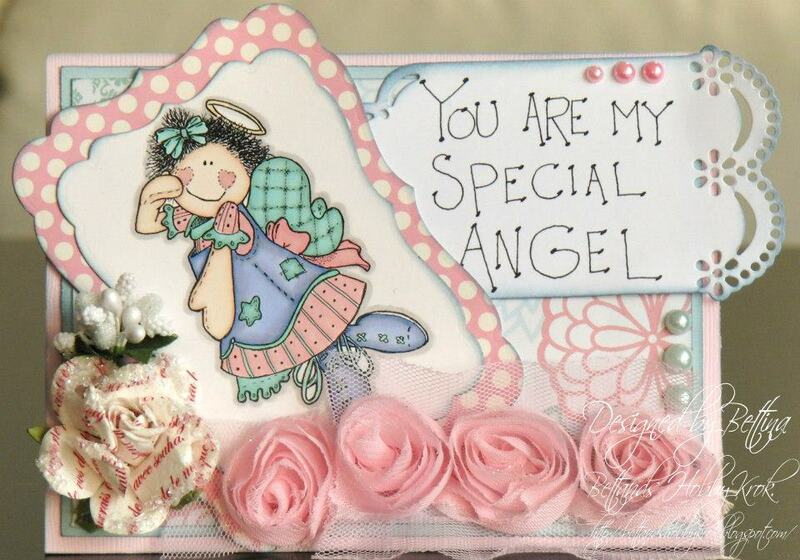 The truth is that crafters won't have any problem handling this beautiful product. 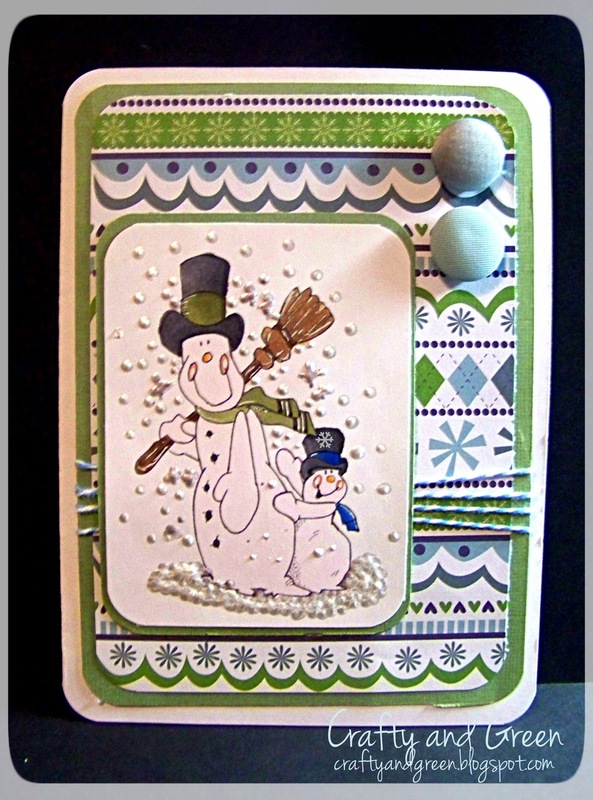 If you already work with glitter or embossing powder, this will be a piece of cake for you. I used Cricut's Plantin cartridge to cut a heart from the backing of a pad of paper since I didn't have a chipboard heart in my stash. Then I placed the heart on a piece of Scor-Tape and trimmed around the edges with non-stick scissors, keeping a small border of tape (just enough to cover the cut edge of my heart). When that was done, I flipped the heart over onto a scrap sheet of paper and peeled off the backing. I opened the bag of gold leaf, and that's when the fun began! Beautiful pieces of varigated colored red and pink gold leaf just waited to be taken out of the bag. I carefully lifted out a small piece, carefully applied it to the sticky heart and just as carefully smoothed it out as best as I could. So far, so good, and so very pretty! In no time I relaxed and picked up the pace. I found I didn't have to be too fussy about covering the entire area because, when I picked up my brush and started removing any excess pieces of foil, they naturally stuck to any areas that weren't already foiled. There was very little waste, but you could return any crumbs to the bag. I was surprised at the very generous amount of gold leaf you receive in the bag. Well, covering the heart was so much fun, I decided to run a strip of 1/2 inch Scor-Tape across my 5 1/2 inch designer paper and foil that, too. At this point I cut a label with a Spellbinder, stamped and heat embossed my sentiment, and adhered that to the upper corner. I cut a piece of red cardstock at 5 3/8 inches, and a base card at 5 3/4 inches from white Stardream Metallic cardstock. All the layers were then adhered. I colored the fur of my bear couple with Copics. After allowing them to dry, I moistened a scrap of old washcloth with Blender Solution and dabbed the bear bodies to create the look of fur. 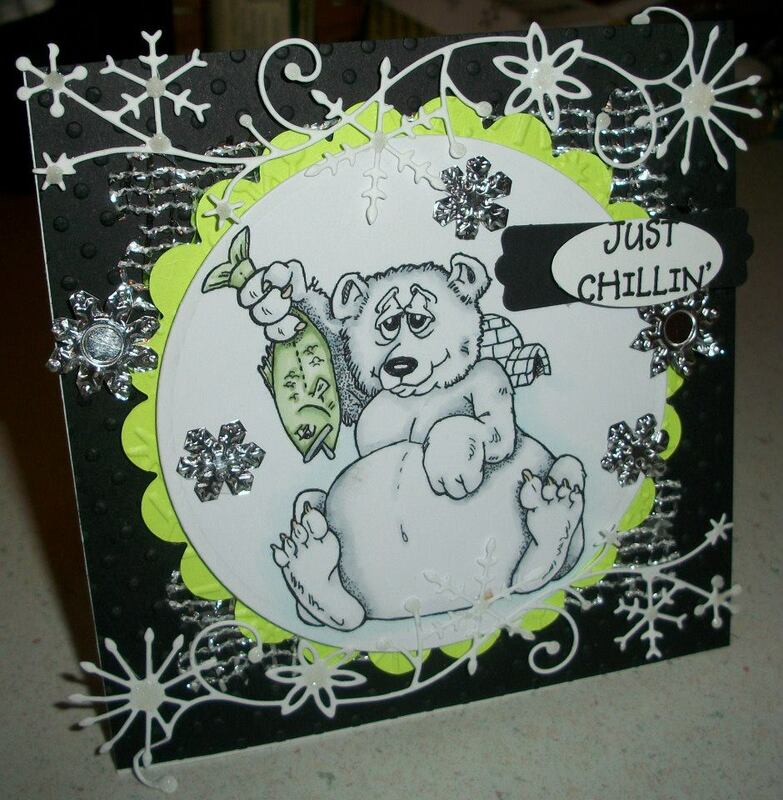 When that dried, I colored their clothes and patches, and adhered the bears to the font of the card with pop dots. Adhering the foiled the heart was all that was left to complete the project. 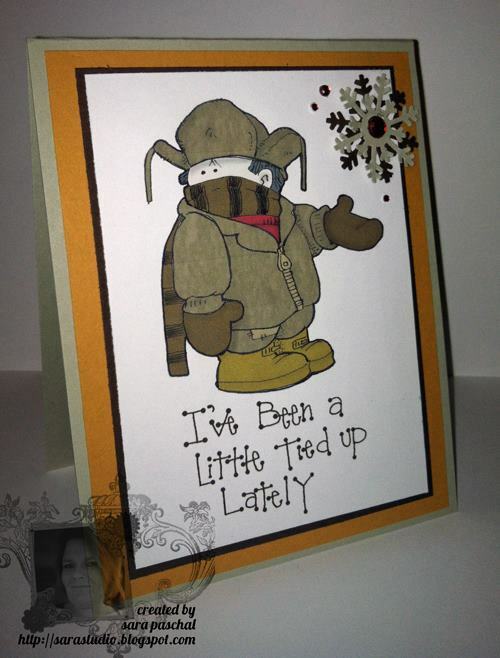 Unfortunately, as you can see below, The Boss was not impressed with how much time I spent creating this card. She placed her body strategically between me and my supplies - a strong signal that NOW would be good time to pay attention to the cat. Come join the fun over on these challenge blogs for a chance to win 5 QKR Stampede digital stamps of your choice! We hope you will join us as we support 613 Avenue Create and Glitter n Sparkles' fun challenges and we look forward to seeing your creations. Welcome to QKR Stampede's 23rd Challenge! 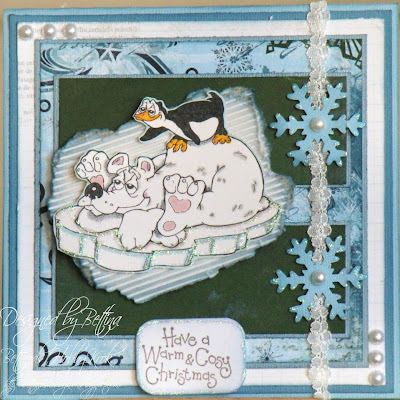 Thank you so much to all of you who joined us last week for our Cold & Frosty Challenge! What Beautiful Creations! digi 14513 "Be My Valentine"
Who are We Sponsoring This Week?? 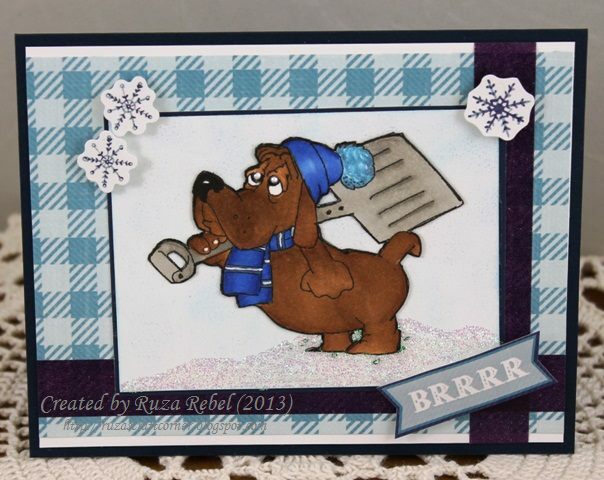 We hope you will join us as we support Crafters Cafe fun challenges and we look forward to seeing your creations. 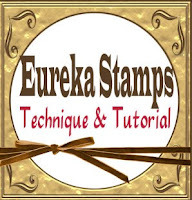 Technique and Tutorial Wednesday "Tent Card Tutorial"
QKR Stampede and Eureka Stamps! the picture - those are nerve pills!!! 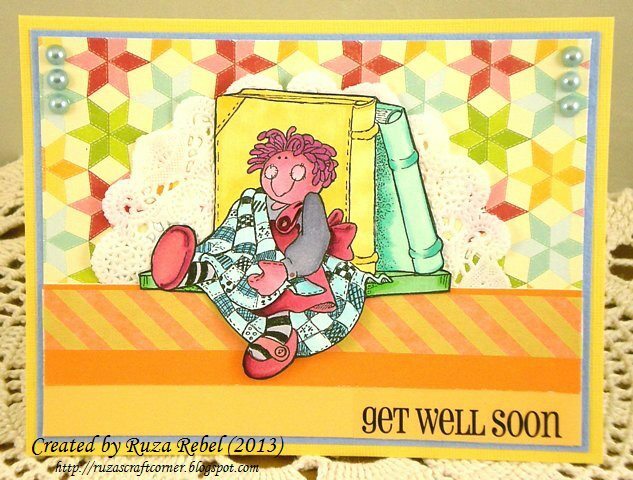 is already colored and cut with a Spellbinders mat as is the sentiment. Step 1: Start with a card base of 6" x 12". Score in the middle using your Scor-Pal at the 6 inch mark. Then score at the 1 1/2" mark from each end. Using your bone folder tool fold and press your folds. Set your white card base aside. 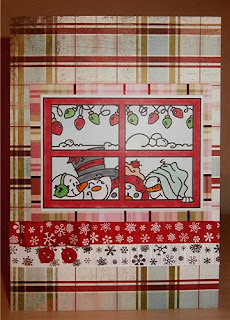 Step 2: With your 2nd color of either designer paper or card stock (red in my case) you want to cut 4 pieces measuring 4 1/4 " x 5 3/4" each and set aside. Now cut 4 pieces measuring 1 1/4" x 5 3/4" each and set those aside. Step 3: I used 3 layers on my card, however, if you only want to use 2 layers then you are ready to go on to Step 4. For the 3rd layer - cut 4 pieces measuring 4" x 5 1/2" each. Then cut 4 pieces measuring 1" x 5 1/2" each. Set all of these aside. Step 4: Using whatever adhesive you normally would use go ahead and adhere your layers to your card base. 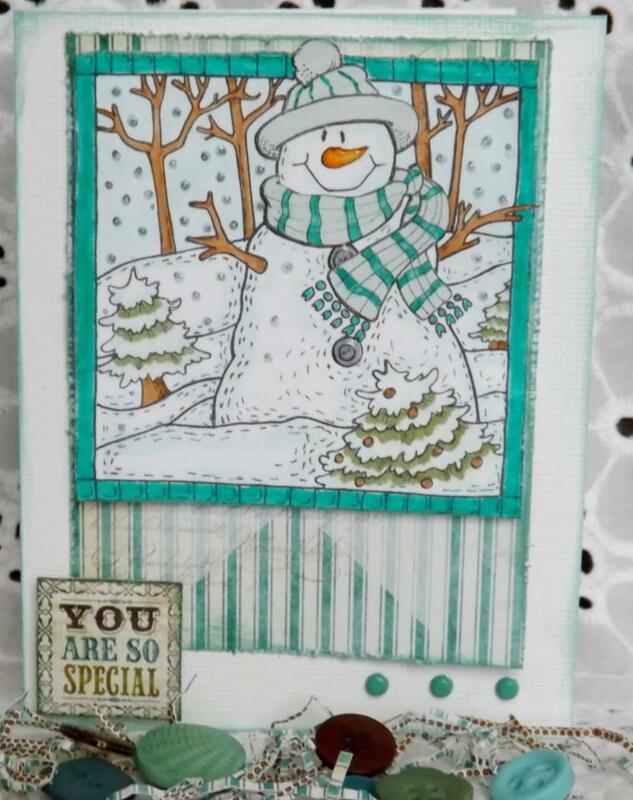 TIP: You will notice that after you adhere your layers to your card base the card will then meet in the middle on it's own. Step 5: You should have your image colored and cut by this time. I used a Spellbinders Die, Label Seventeen to mat and cut my image. I also colored it using Copics. 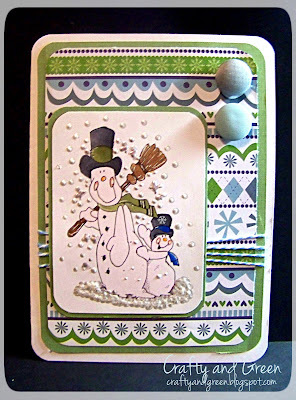 Step 6: Adhere ribbon or another embellishment to the edge of your card. You can use anything you would like. 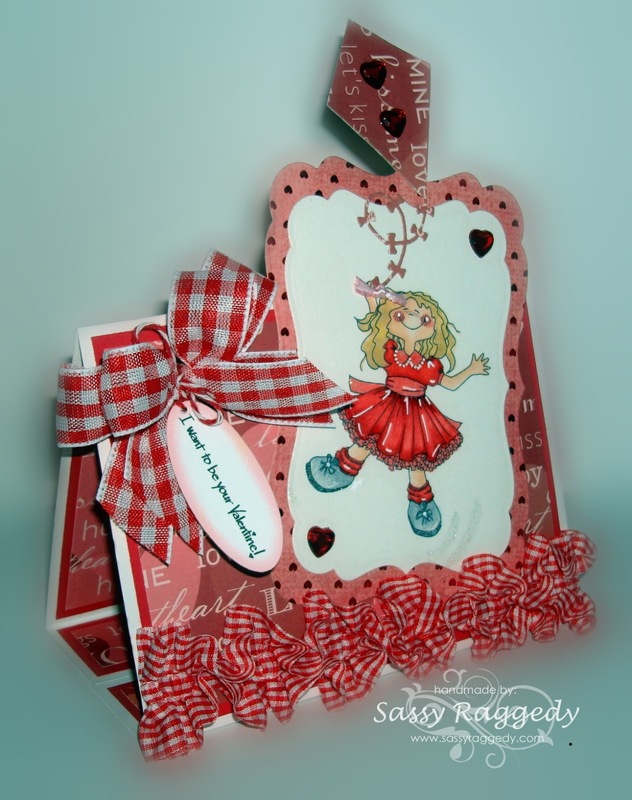 Next, I tie my bows and tied the sentiment to the bows using red and white bakers twine. 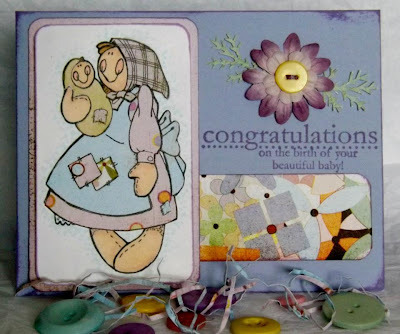 Then, adhere your image and mat to the card along with any final embellishments. I want to thank everyone for stopping by today to see what we are showcasing. We hope you will join us as we support Kaboodle Doodles fun challenges and we look forward to seeing your creations. Welcome to QKR Stampede's 22nd Challenge! Thank you so much to all of you who joined us last week for our Snowman or Snow Challenge! What Beautiful Creations! Thank you so much Darlene!! This is truly Beautiful! Hello! It's time for a new Technique and Tutorial post. 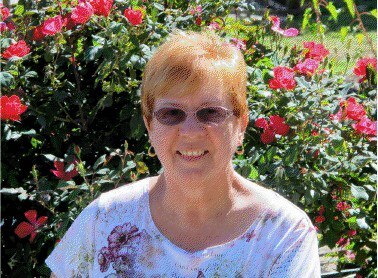 Deb with you today instead of my T&T partner, Joann, who is experiencing wacky weather and power outages in her part of the world. 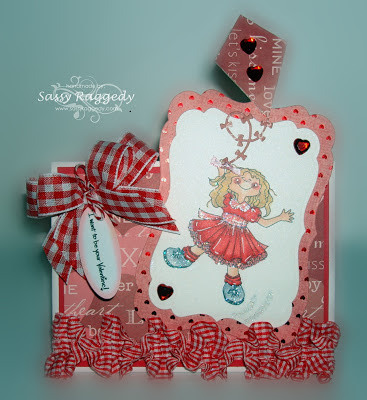 I'm sharing a Valentine and continuing the Basic Card Making tutorial introduced last week by Joann. 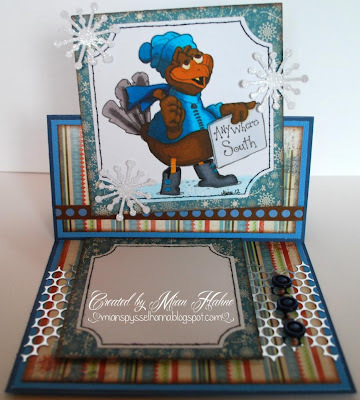 In Part 1, Joann outlined how to make a basic card. 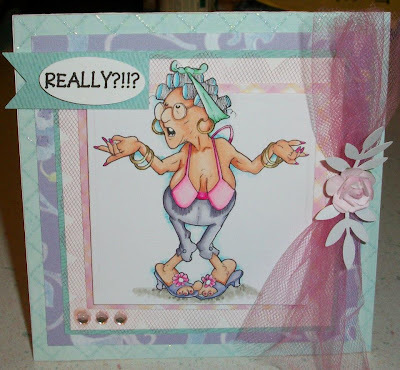 If you are new to card making, you might wonder what to do next. Here in Part 2 of Basic Card Making, I'll share some ideas on how to proceed with choosing your image, paper, color and embellishments. There are no hard and fast rules about how to proceed with your choices and beauty is, after all, in the eye of beholder. So choose what is pleasing to you and just have fun. The first step is to think about why you are creating a card and, especially, the preferences of the person who will be receiving your card. What colors do they like? Do they seem to favour a victorian kind of style or are they more contemporary? 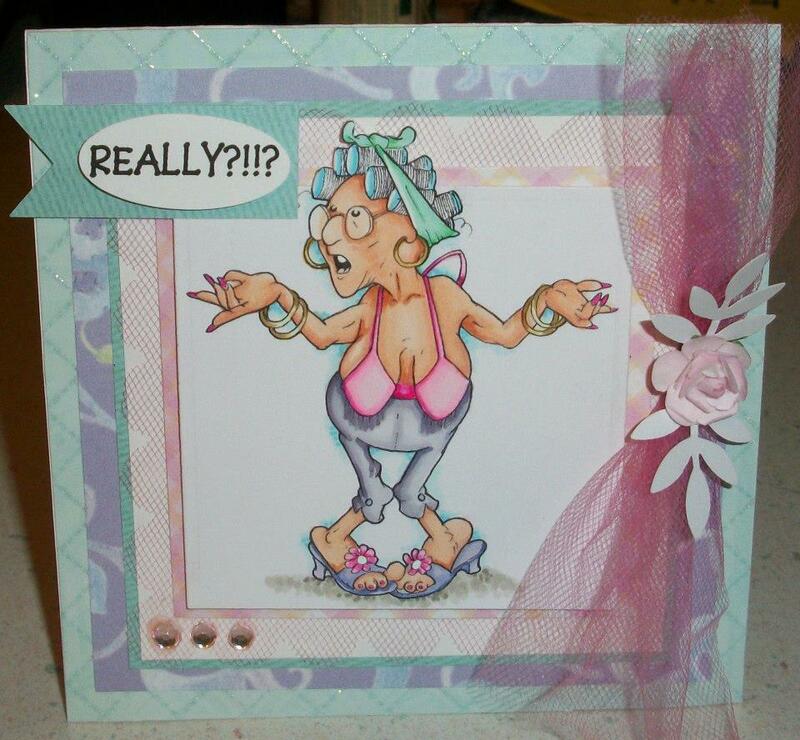 Are they more likely to appreciate hearts and flowers, or would they get a kick out of a humorous card? 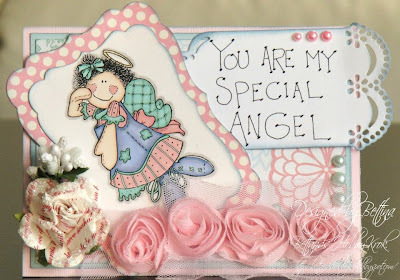 Today, I want to create a Valentine and, as it's for this blog and not any one person, any style would be appropriate. 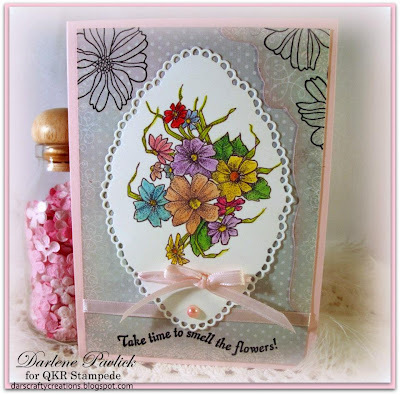 I fell in love with Eureka's Digi 1001 Heart Flowers in a Frame and Digi1101 Be My Valentine. Now you want to stamp or print your image. There are so many different products and methods that take stamping to a true art, but today - since we are thinking about a basic card - let's stamp or print in basic black. 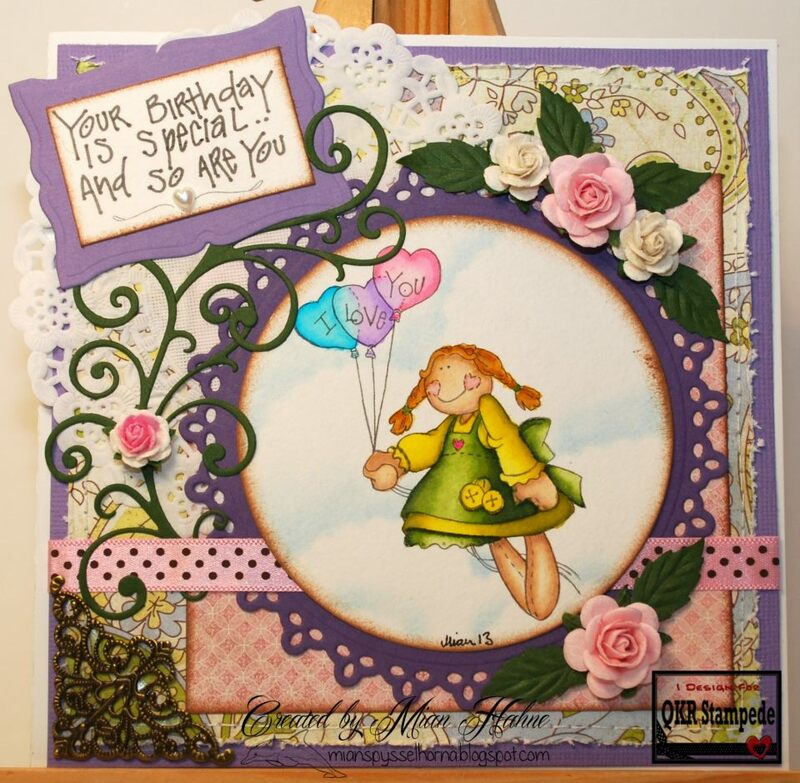 As our tutorials roll out, you will see many, many different ways to stamp and color an image. 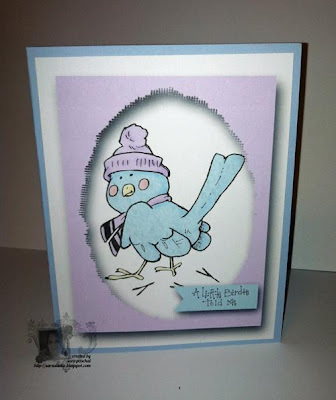 You want to stamp or print on papers that work well with the coloring medium you prefer. Or you could choose to place your image on colored paper and not do any additional coloring at all. This particular image would look spectacular done with VersaMark and Heat Embossing Powders on a colored paper. I love, love, love my Copics markers and wanted to use them with these beautiful Valentine images, so I printed my image on X-Press It Blending card. One of the advantages to working with digi images is that you can size them to fit your project, so I have chosen to size my focal image to 5 x 6 inches which will take up most of the space on my card base which is 5 1/4 x 7 1/4 inches. Generally, card makers will choose some kind of beautiful paper (I'll refer to this as Designer Paper or DP) to layer between their card base and their focal image. Again, think of your recipient and choose a DP that might be pleasing to them. Also keep in mind the style of your focal image. Working with such a large and intricate image, I wanted to pick a DP that would compliment and not compete with my image. 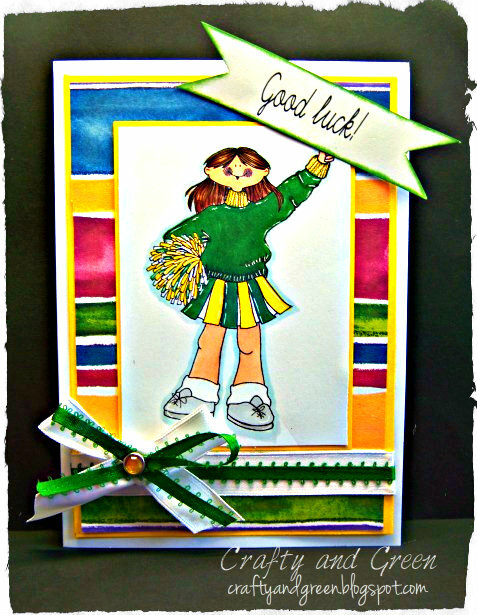 Select a designer paper that will work with the colors you had in mind for your focal image. I knew I wanted to color my image with pink, purple and red, so I needed a DP to look good with those colors. 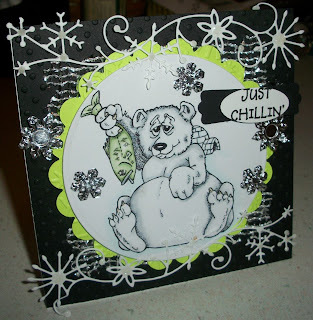 I narrowed my choices down to a glitter paper and a pearalized paper, both in solid colors. Now that you have your DP chosen, it's safe to go ahead and color your image﻿. You could color your image and then try to pick a paper, but it might be harder to get a good match that way and you may end up having to color a second image. Next, trim away any excess paper around your image and adhere it onto your DP. After placing the colored image on both DP I was considering, I went with the red sparkle. The final touch to a beautiful project is that one bit of embellishment which takes your card from good to great. 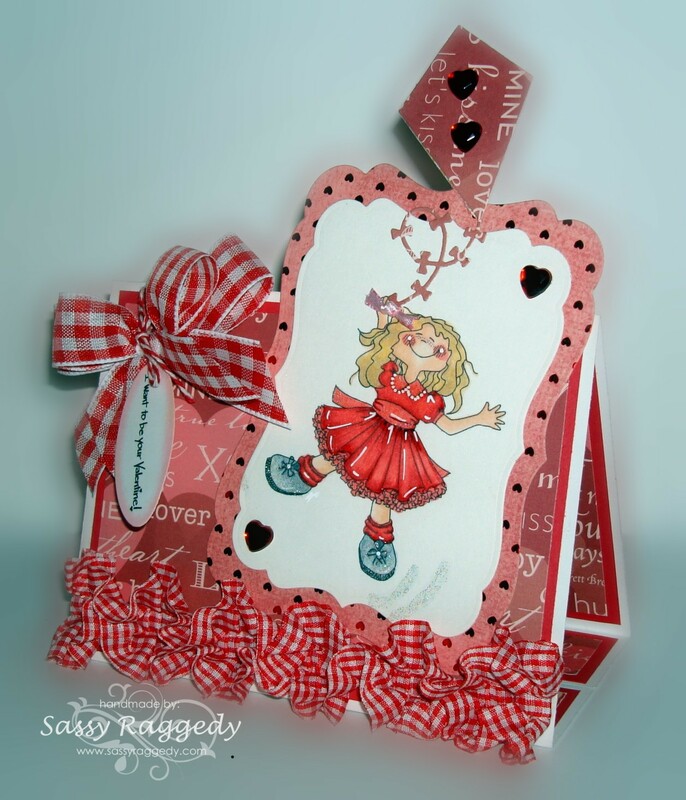 The choices for embellishments are absolutely unlimited and include ribbon, flowers, glitter, brads, pearls, crystals, chipboard, stickers and on and on. Sometimes it takes a while to decide what that final touch should be. I'm from the "less is more" school, especially with such a detailed image - but that's just me. Lay out some of the items you have in your stash, and choose what looks good to you. If you're not sure, walk away, have a coffee and come back later. In the following photos, you can see some of the options I considered. You can see better in some photos that I added dots of liquid pearls and glitter to the image itself, along with ribbon and three brads at the top of the card. You can also see in the photo below that I didn't need fancy Copic techniques here - just a layer of color that you could do with any type of marker or crayon. The inside of a card provides another great place to personalize your project. 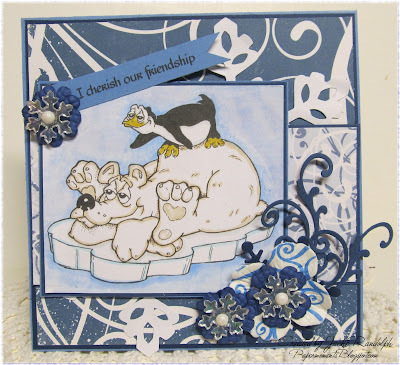 I try to choose an image or sentiment that matches the style of my card front, and I try to use some of the same materials. I'd love to receive your comments or questions on our tutorials. 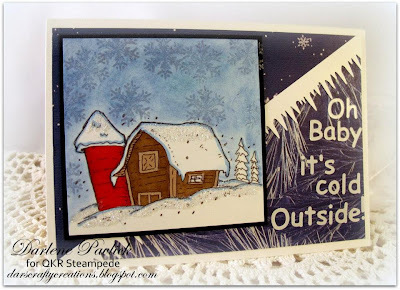 Let me know what you think or what you'd like to see!﻿ Don't forget you are always welcome at our personal blogs, Deb and Joann.